Lub d, with two successful hostels in Bangkok, announces its latest whacky project, Lub d Sleep & Surf @Sukhumvit 26. 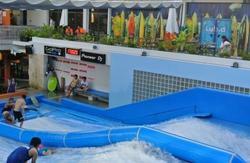 This October Lub d Bangkok invites guests to stay in the first Sleep & Surf hostel in the world which will be created at Flow House Bangkok (ranked number 6 of 266 Attractions in Bangkok according to Tripadvisor), only urban beach club with a wave machine, pool, bar/restaurant, sunbath area, loads of games and activities. Perfect place to chill and hang out with family and friends. This is available until December 2014 only. Lub d Sleep & Surf consists of 20 mixed dorm beds (10 bunk beds) in a surfing style room. We also provide free Wi-Fi, 24-hour reception and common area. There are plunge pool, coffee shop, sport bar, football table, table tennis, sunbath area, secured lockers, RipCurl surf shop, and restaurant in Flow House area that you can feel free to use. The bathroom is spacious and shared with Flow House. Lub d Sleep & Surf is near Phrom Phong Skytrain (BTS) Station. Take Exit No 4 and take a motorbike taxi to A-Square. It costs 20 Baht for motorbike taxi. Take taxi is also easy.